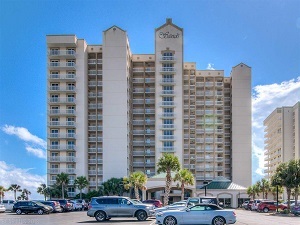 Orange Beach gulf-front condo for sale at The Sands. This 3BR/3BA gem is in a peaceful & quiet complex occupied by other owners. All neutral tone tile flooring in every room ready for your decorating touches. Chef's delight kitchen features beautiful granite counters & new stainless steel refrigerator & ice maker in 2016. Split bedroom floor plan for guest privacy. Expansive views of the beach & pool from spacious balcony. New HVAC in 2018. Fabulous amenities include indoor & outdoor pools, sauna, hot tub, private beach access, BBQ area, and tennis courts. Grocery stores, restaurants & shopping within walking distance.